First thing you will need to do is to register for the preview of Automation. Usually you will get approved via email immediately, i.e. 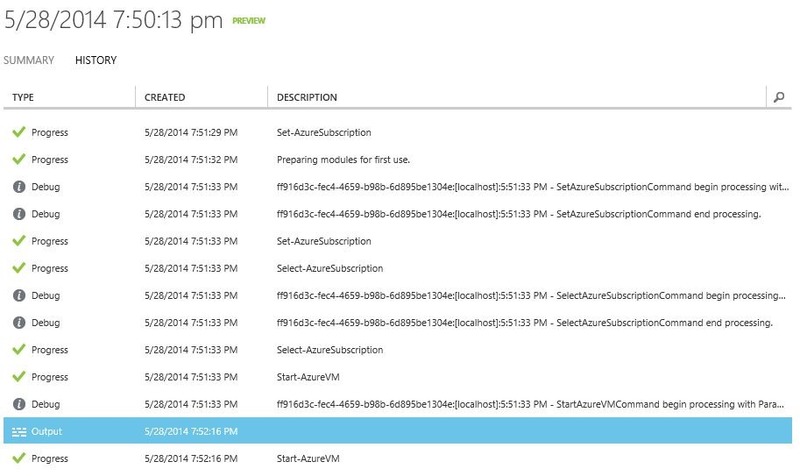 there is no queuing and waiting like for some other popular and resource-constrained Azure services (e.g. RemoteApp). 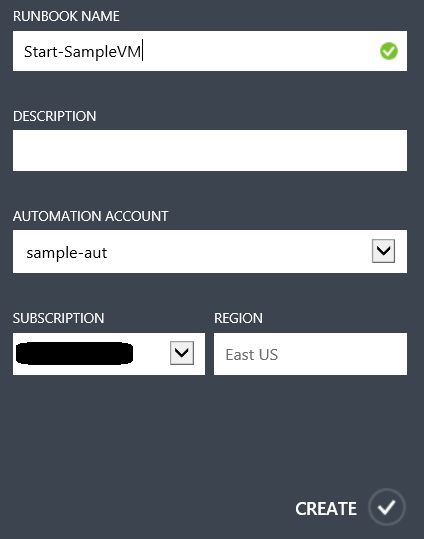 Once activated, navigate to the Automation section of the Azure management portal and create a new automation account, called sample-aut. At the time of writing the preview was only available in the East US datacenter, so you don’t have a choice. Enter the automation account and navigate to the Assets section. 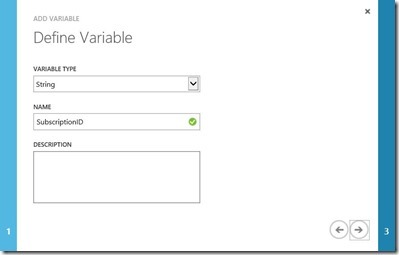 Here you can see that an Azure module is assigned to the account by default, which contains the Azure PowerShell cmdlets. 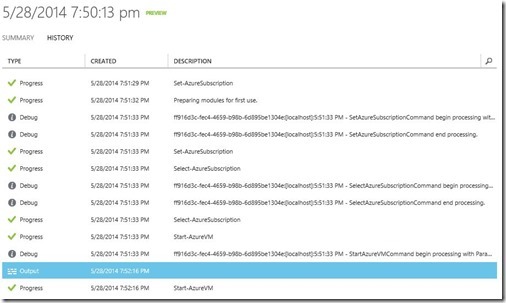 The default version is currently not the latest PowerShell release for Azure (0.8.2), as the portal shows a date of 3/19/2014 in the Last Update column. If the version isn’t current, you should update the module to the latest version in order to avoid issues later on (Anders Eide wrote a good post about that). So, if you are not yet on the latest version on your local machine, update it from the Azure Download Center. Then, go ahead and save the Azure subfolder in C:\Program Files (x86)\Microsoft SDKs\Windows Azure\PowerShell\ServiceManagement into an archive called Azure.zip. On the Assets page in the portal, import the zip file via the Import Module button. This will upload the file and register the cmdlets in the automation account. After a couple of minutes you should get a success message, and the Last Update column should display the current date & time. 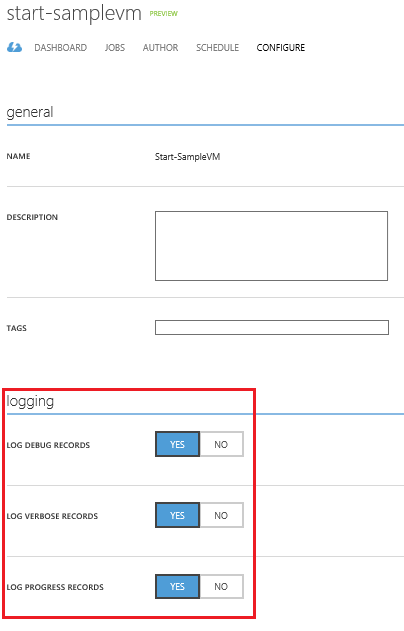 Before we can create our runbooks to control VM startup & shutdown we have to add a credential and define a couple of settings for the automation account. 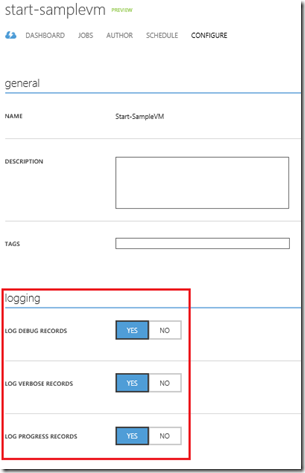 A credential is required in order to authenticate to the subscription that is hosting the target VMs. For our scenario we will create a certificate credential and use a management certificate. If you do not already have a management certificate in your target subscription you can create a new one as described here. The .cer file has to be uploaded in the Management Certificates section of the Settings page in the portal. Click Add Settings under Assets in the Automation account and select Add Credential. Choose Certificate as Credential Type and pick a name (I used sample-cert). Next, select the .pfx file of your management certificate from your disk, enter the password and finish the wizard. In order to define the variables, for each of them click on Add Settings under Assets in the Automation account and select Add Variable. 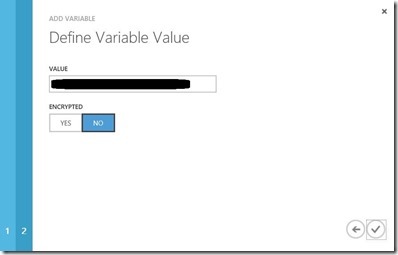 In the wizard, specify name and value for the variable as shown below. Make sure to select variable type String. Now we can finally create our first runbook, which is actually nothing else than a PowerShell script encapsulated in a Workflow object. 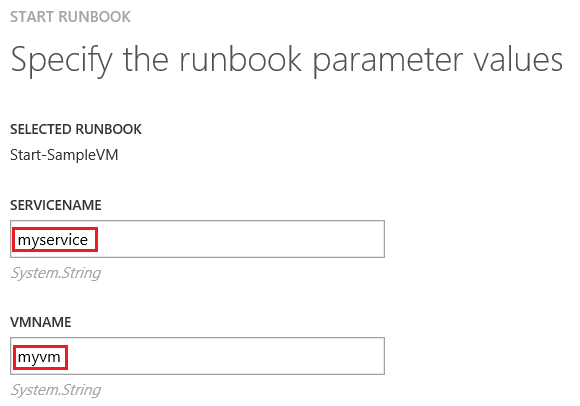 From the New link in the management portal, select App Services – Automation – Runbook – Quick Create, fill in the dialog as shown below (I used Start-SampleVM as the runbook name) and create the runbook. 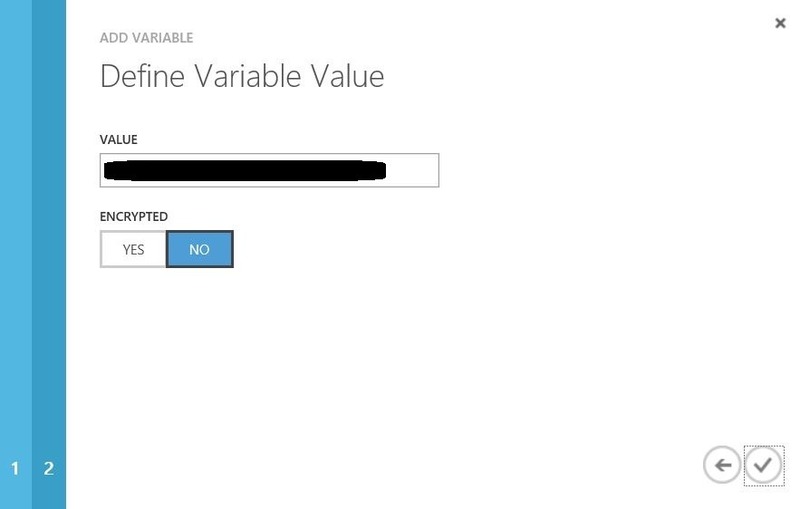 The script basically just selects the proper subscription, authenticates using our custom certificate and executes the Start-AzureVM cmdlet on a VM that can be specified through the parameters $VMName and $ServiceName. Note that we are using the variables we have defined previously. Note that I have added the –Force parameter. In case the VM you are planning to stop is the last one in the cloud service the statement will fail without this switch. After a couple of minutes you should get a success message, which means that startup of your VM has begun. 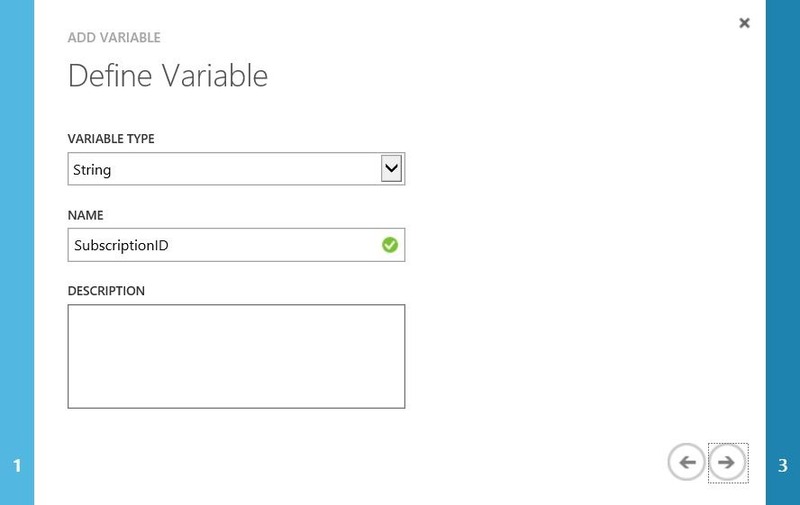 You should now check in the Virtual Machine section of the management portal if the VM is coming up. You should now also test the Stop-SampleVM runbook to make sure it is working properly. Now that you have successfully tested the runbooks you need to publish them. You can do that via the Publish button on the Author page. After publishing the script will show up read-only on the Published tab. 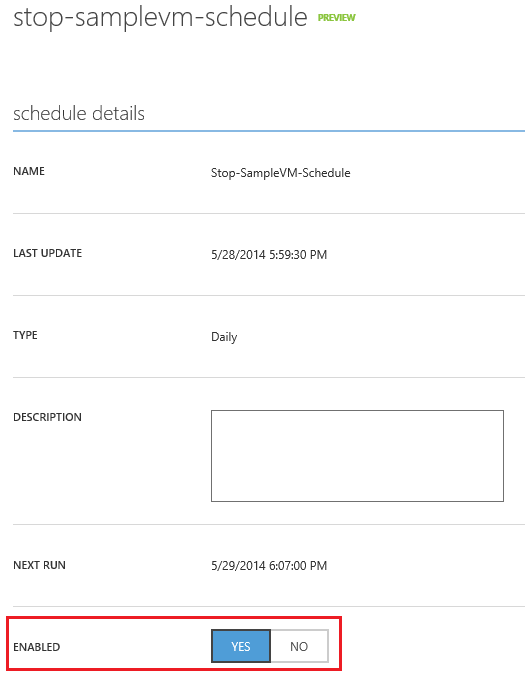 As a last step, we need to define a schedule for our runbooks to let them run at certain times. Head over to the Schedule tab of the Start-SampleVM runbook and click on Link to a New Schedule. In the second step of the wizard you can define when the runbook should be executed, e.g. daily at a certain time with or without an expiry date. If you want to control multiple VMs in a single go, you could either extend the scripts shown above (i.e. stop more than one VM per runbook, e.g. 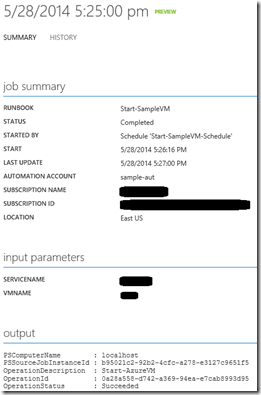 all VMs within a single cloud service) or create separate runbooks for the VMs. Schedules can be shared between runbooks, i.e. 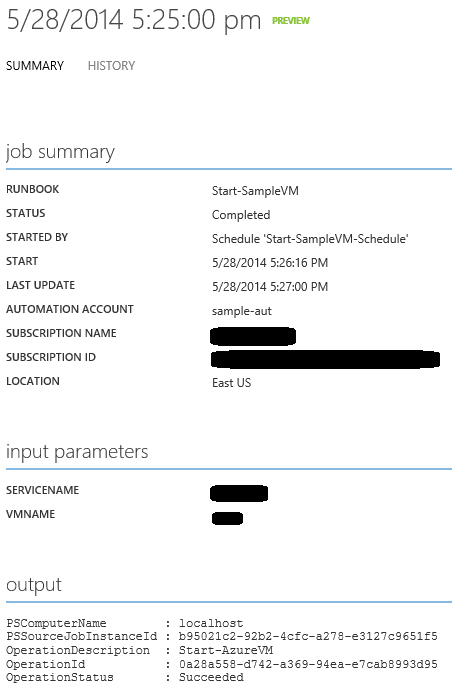 you could create separate runbooks for different VMs and let them run on the same schedule. Note, that in this case parameters (i.e. 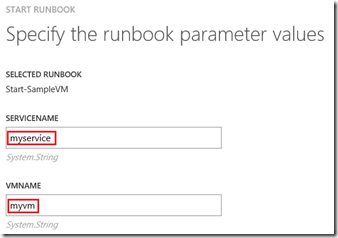 VM name and service name) are stored with the runbook instances and not with the schedule. If you want to stop the automated startup/shutdown of your VMs you can disable the corresponding schedule in it’s settings in the Assets section. 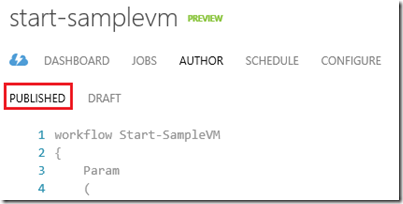 So, with the approach described above you can easily create runbooks for starting and stopping your virtual machines on a schedule. And that’s even without any cost, as long as you don’t exceed the limits of the free pricing tier. 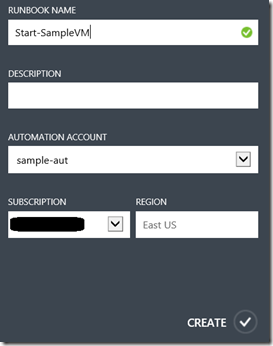 This entry was posted in Automation, Microsoft Azure and tagged Automation, Azure, Cost Saving, Microsoft Azure. How much power / physical server do you save with this tool ? Do you have any figures to summarize cost and environmental savings ? I couldn’t get myservice.cloudapp.net to work as the service name. Kept telling me it couldn’t find the service. So I just cut off the .cloudapp.net and it worked (“myservice”). Great article, thanx! 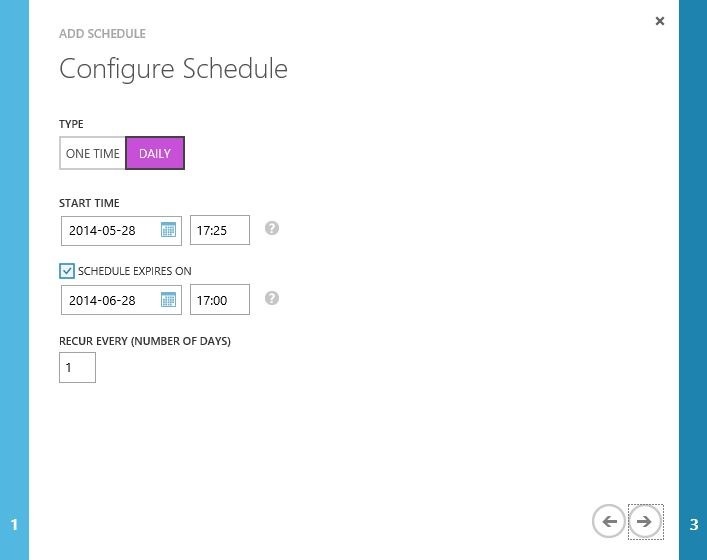 What surprised me is that the schedule have very limited setup – one time/hourly/daily only – no day selection etc. So if you need more “advanced” scheduling scenarios you have to code this in the script. 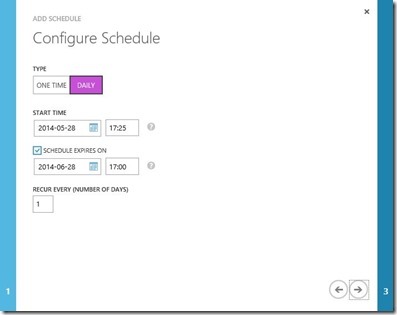 Additionally once created schedule can’t be changed anymore … etc. I must’ve done something wrong; can’t get either the start or stop to work. It is a very helpful documentation that you wrote above, however I am stack at certain point. is associated with this subscription. It really looks like my cerificate failed my authentification and it refused to execute but I do not understand as I have a correct certificate valid until 2015 which is associated to my subscription. It would be awesome if you had any clue to help me. You actually posted the link to this exact page, and it doesn’t help. >> The .cer file has to be uploaded in the Management Certificates section of the Settings page in the portal. >> Next, select the .pfx file of your management certificate from your disk, enter the password and finish the wizard. I didn’t figure out what we need exactly – a .cer or a .pfx file? The Management Certificates does not allow .pfx. I figured it out. After creating a .CER file, you should import it and create a .PFX file to this certificate. .CER is imported to Settings -> Management Certificates. .PFX – to Automation -> Assets correspondingly. Can you expand on this in any way? The cert part is the only part I don’t understand AT ALL given the way it was explained here. This article just links to a very generic MSDN blog about certs in general and I still have no idea what we are trying to accomplish or where exactly this make cert command is executed? Clearly I can’t do it on my local machine and doing it on the VM in question didn’t work. Where do we make this cert exactly? I apologize for my lack of understanding on certs but I have 0% understanding of them and this article seems to suppose that you already know about them and as such give give a little nudge in the right direction with no real explanation of where and what we are supposed to do regarding the cert. Did you solve this problem? I have the exact same error when I try to execute a runbook on my Hybrid Worker Group. That’s nicely described. Thank you..
Hi really Thank you for this post. However, it is still unclear to me why I need to install smth from Download center and where to obtain that .pxf certificate and why can’t I just work with powershell credentials. VMs can be shutdown or scaled down on a schedule. An alternative for those who prefer a non-scripting solution is a service called VMPower (https://vmpower.io/). There is a calendar feature that makes automating shutdown, startup and resize of VMs pretty intuitive to do in <15 minutes. With the GUI, it's very accessible for non-technical team members to manage too. Also for the folks juggling cloud subscriptions across multiple cloud providers (Azure, AWS, & GCE) , you can manage all of your VMs in one unified dashboard.